Learn to think like the greatest creative minds?to question, challenge and create new rules for your ideas of love, spirituality, happiness and meaning. 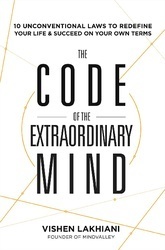 This book is a blueprint for retraining our minds to hack everything?how we work, love, parent and heal?and learn to succeed on our own terms. You will learn to bend reality, question the rules, transcend the culturescape, embrace your quest, practice consciousness engineering, live in blissipline and push humanity forward. You will question your limits and realize that there are none. Your understanding of the world around you and your place in it will change, and you will find yourself operating at a new, extraordinary level?with happiness, purpose, fulfillment and love. Vishen Lakhiani is the founder and CEO of Mindvalley, an education technology company specializing in innovation in education by introducing wellness, mindfulness and personal development into global education and lifelong learning.